Canon IR 3570 toners are invariably considerably more affordable when you buy from Cartridge Save. We take great pride in supplying Canon toner which you'll find discounted in price. Still concerned? If you find yourself anxious to reduce costs then it makes sense to take advantage of our free next day delivery service which will reduce the cost of ordering Canon IR3570 toner online. We stand over each and every purchase of reliable IR-3570 toner cartridges with a cast iron money back guarantee so we can ensure effective results. On the grounds that we aim to have 100% customer satisfaction any time you spend money on toner printer cartridge we will always refund your payment if you're dissatisfied. Don't delay! Order now to save! The Canon IR-3570 ImageRUNNER ADVANCE office black and white printer offers excellent production solutions for small to large workgroups looking for a high-volume, professional quality printer. It produces as many as 35 prints per minute, while its scan feature can save up to 28 images per minute. The Canon IR3570 multifunction printer is an all-around device that prints, scans copies, and faxes, without compromising output quality. The Canon IR-3570 printer uses high yield cartridges, which promote cost-efficiency, though it only uses black toner, meaning no colour printing support. 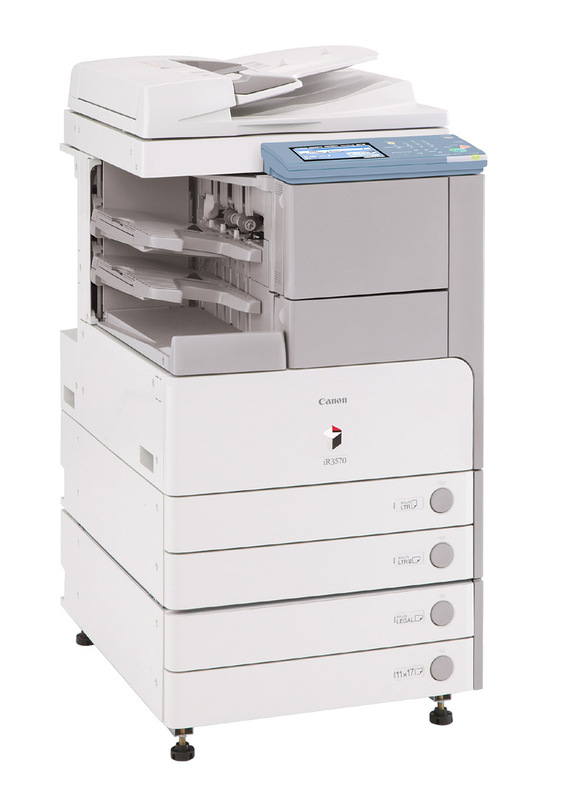 The Canon IR-3570 black and white photocopier looks just like a typical multifunction copier. It has several upgradeable features along with a number of built-in accessories like the automatic document feeder and duplex units, along with a large menu display and intuitive control panel, versatile connectivity ports, and standard paper input trays. For enhanced productivity, the Canon IR-3570 mono laser printer can be used with additional paper cassettes that allow more versatile paper handling, finishing options, and a high-capacity hard disk for expanded memory, especially for shared printer environments. One of the best advantages of using the Canon ImageRUNNER ADVANCE 3570 is its reliable output rates. It can produce as many as 35 pages in a minute, while the copier and scanner can process 28 images in the same amount of time. The maximum resolution that the Canon IR 3570 digital copier can produce when printing is 2400x600 dpi, while copies are 1200x600 dpi at best. Duplicates can be reduced or enlarged as needed, while faxes are sent at a consistent rate of 33.6 Kbps. Its control panel features a touch screen LCD for easier controls. Toner replacement costs are comparatively cheap because the black Canon IR3570 cartridge has an estimated capacity of 24,000 prints. However, the ImageRUNNER IR3570 does not offer colour printing, which is not ideal for offices that rely on coloured presentations. Nevertheless, the IR-3570 copier is an excellent choice for a dedicated printer, especially with its advanced features geared towards professional printing.